Actress Ashley Eckstein, the voice of Ahsoka Tano on the animated series, Star Wars: The Clone Wars, had the ultimate cosplay experience recently when she dressed up in full make-up and costume as the Star Wars character she brings to life on the show. Ashley Eckstein, the voice of Ahsoka Tano on Star Wars: The Clone Wars in full cosplay make-up and costume of the character. As the voice of Ahsoka...I am also a fan," says Ashley Eckstein. "Year after year I have been going to conventions seeing hundreds of girls dressed up as Ahsoka, secretly wishing, I, too, could someday try on the costume. Actress Ashley Eckstein, the voice of Ahsoka Tano on the popular Cartoon Network animated series, Star Wars: The Clone Wars, had the ultimate cosplay experience recently when she dressed up in full make-up and costume as the Star Wars character she brings to life on the show. She documents her experience and the world of cosplay in a new blog she has written exclusively for CNN Geek Out! online and shares photos of the finished product. Cosplay, short for "costumed play," is the experience that thousands of fans participate in each year at conventions around the world where they dress up as their favorite character from a sci-fi or fantasy movie, TV show, anime, video game or book. It attracts both young and old alike. Those outside the world of cosplay don't always understand the attraction fans have for bringing their favorite characters to life, however, Ashley, in her CNN Geek Out! blog explains why she not only understands their passion and enjoyment but embraces it. She reveals that she has secretly wanted to dress up as Anakin Skywalker's Padawan learner, Ahsoka Tano, for years. "As the voice of Ahsoka, I simply go into the recording studio and record my lines for the show," Ashley relates in her CNN Geek Out! blog. "There is no need to ever dress up as the character because they only need our voices to bring the character to life. However, I am also a fan, and year after year I have been going to conventions seeing hundreds of girls dressed up as Ahsoka, secretly wishing I, too, could someday try on the costume. 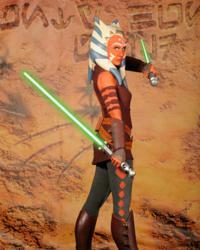 Well, with the help of my friends, my wish was granted, and I got to dress up as Ahsoka for the day!" When not recording the voice of Ahsoka, Ashley oversees her company, Her Universe, which produces fashionable sci-fi apparel and accessories for fangirls. To see the latest releases in the line visit http://www.heruniverseshop.com/starwars.aspx . To read Ashley's full cosplay blog and to see more photos of Ashley as Ahsoka Tano visit CNN Geek Out at http://geekout.blogs.cnn.com/2012/03/06/jedi-trappings-complete-the-fan/! Darth Maul returns in the Star Wars: The Clone Wars season finale starting on March 9th at 8 PM on Cartoon Network!